My daughter’s classmates call her the “Queen of Slime”. They marvel at her “Slime Station” which I call my formal dining room. This high-ranking “Slime Status” is NOT something I encouraged or welcomed to our home. After all, I am still traumatized by the pink slime disaster, when our recently new soft tan carpet became pink and stiff in parts. And, of course, this disaster was resistant to the carpet steamer and therefore destained to be permanent. Slime making is not only messy, but it takes supplies. Lots of supplies. 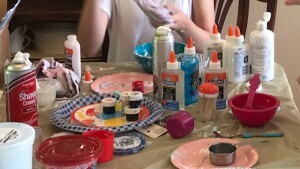 My daughter uses every last dime of money she receives or earns in the “slime section” at Target, Michaels or Joann. Of course, I’ve been forced to adapt to this obsession. I had to buy a new cabinet and bins to store all these supplies. It is an investment in family harmony; I can now re-claim my dining table when necessary. What is in the slime cabinet? Elmers glue (school, clear and glitter). One container is a gallon size. What slime materials are on my daughter’s Amazon wish list for Christmas? 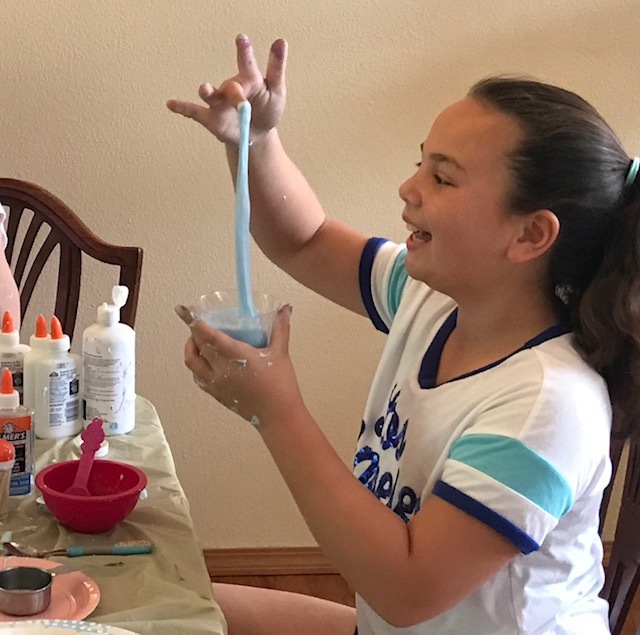 Scents for slime are marketed by an essential oil company and come in Bubble gum, Orange Creamsicle, Peaches & Cream, Blue Cotton Candy, Oatmeal Cookies and Chocolate aromas. They want $15 for these small bottles (less than 10 ml) of scents. We can make our own slime scents. My daughter has eczema and should avoid fragrances. Reason number 2 is why I frown on slime scents. I understand safety of flavors in food applications (ingestion), but do not know how safe they are if they touch the skin (cosmetic use). For the last four months we have sought medical attention for the blistering eczema on my daughter’s hands. Initially, I thought slime making was the problem, so I “grounded” her from making slime. After allergy and patch testing, we have learned that a preservative found in many liquid soaps, shampoos and conditioners is responsible for the eczema. With a little detective work and an overhaul of all our cleaning and personal care items, there has been noticeable improvement in her skin condition. Now that we know what she is allergic to (a biocide-Methylisothiazolinone) and my daughter has agreed to use gloves while handling slime, it is ok to start using scents in slime. I want to help her make a few scents. We will start with bubblegum scent, it’s a fairly easy scent to create using methyl salicylate, spearmint oil, orange oil, iso-amyl acetate, vanillin and cinnamon. Orange creamsicle will also be a good candidate: orange oil, diacetyl and vanillin. Time to create. 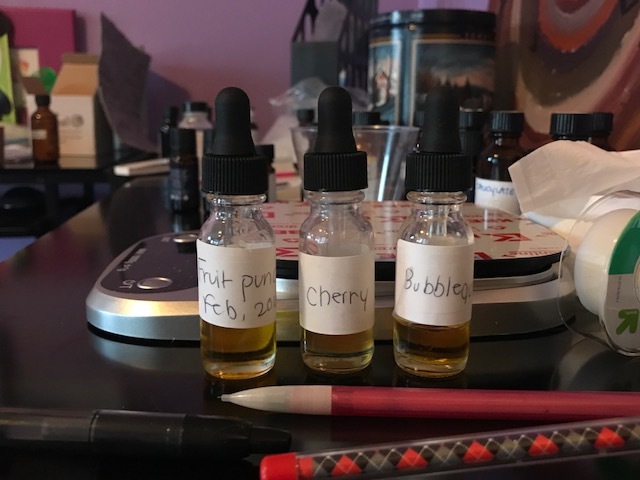 I’ll take the scents for slime off her wish list and make “The Queen” some signature scents, after all personalized homemade gifts are the best. Any you interested scents for slime? I’m putting together scent kits for kids. You spoke to some of my pain here, as a fellow slime mother. Good job figuring out that eczema issue – seems like no one ever gets to the bottom of that. I don’t see the point in scents for slime, particularly ones as vile as that company’s selection. An essential oil company makes a bubble gum scent? I picture them extracting the essence from piles of chewed bubble gum! Surely this involves child labor! Or wait, do they have a mastication machine? It opens up a whole world of unsavory possibilities! As always, your blog is a joy to read.